Queen of the coop? Oh gosh, don’t make me blush! I just love being held, walking around the garden to smell the fresh flowers and being sung Pretty Woman in Mom’s arms after a long day on my feet. It’s important to know what’s what in the garden, so the first thing I do when I wake up is walk around the perimeter. It’s my job to make sure that everything’s in order. Once I’ve checked (and sometimes double-checked), then I can eat breakfast. I’ll fight for my flock, so don’t try anything funny around me! I may be small (and only have 3 ½ toes on one foot), but that’s no reason to stare, mister! Move along, move along—I don’t know what the humans are always looking at me for, but it makes me scared and sometimes I poop. I don’t mean to! One time I walked all the way around the garden by myself and found a whole tortilla chip, just for me! I was so excited that I gobbled it up and ran back to Mom as fast as my legs would take me. She sung me If I Knew You Were Coming, I’d Have Baked a Cake, and I agree about the cake. I didn’t tell her about the chip. Buh… buh… Brownie is what the humans call me, but I don’t know why. I’ve never even eaten a brownie, but I would if they’d let me! Sometimes they come in and try to hold me, but I always escape; I don’t know why the other hens like being held. To me, it just feels like ten little carrots poking in my sides and making me squirm. When Mom tries to sing to me, I usually run away. Her voice is okay, but the quiet is what really puts me at peace. Meet the new kids in the coop. Born in the class incubator in late May, they spend their days eating, growing, playing eating, growing, playing. Their latest trick is riding on the heads of their human caregivers. Meet our bright group of learners and leaders! They are what this project is all about. 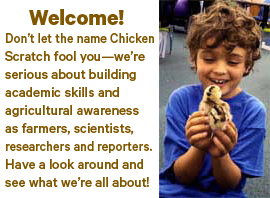 These third and fourth graders serve as scientists, researchers, writers, reporters and farmers. Discover more about the kids’ Sunflower Sentry schoolyard garden and their cooking adventures at Beyond Wonderful Kids Cook: Garden to Table and Barbara Adams Beyond Wonderful Kids Cook Facebook page . © 2019 Barbara Adams Beyond Wonderful & Chicken Scratch Hens. All rights reserved.